As the Gospel recounts, Jesus was hungry and seeing a barren fig tree, curses it, which subsequently withered up. This may seem like a pretty harsh response for not having any fruit on it but there is something deeper at play. The fig tree was a symbol of Israel and it was barren. Jesus demonstrated physically what had already taken place in their hearts. The Holy of Holies in the temple had four courts, three reserved for the layperson. 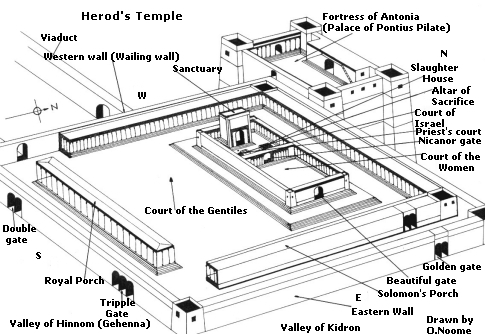 The layout consisted of concentric squares including: Court of the Gentiles (Outermost), Court of the Women, Court of Israel (men) and the innermost, Court of the Priests (In this court of course is the Holy of Holies). During this period of time in ancient Israel’s history, the money changers and those selling sacrificial animals were an important part of temple worship. Many people travelled great distances and many countries to worship in the temple. This, of course, necessitated the ability to exchange currency and purchase the animals for sacrifice. These sellers and money changers could do their business in the Royal Stoa or the Royal Porch. The challenge in the Gospel today is that they had moved out of the Royal Porch and moved into the Court of the Gentiles. But why? The Jews had no love for the Gentiles even through God the Father had commanded then to teach and lead the Gentiles in the ways of the Lord (Isaiah 2:3). The Jews put the money changers and the market sellers in the one area that was reserved for the Gentiles to worship. So why did Jesus drive them out – to make a place and a way for them to pray. He continues by prophesying His Passion, Death and Resurrection and how the ruler of this world is about to be thrown out under judgement – though veiled in enigmatic speech (Isaiah 6:9-10). Jesus then retreats back to Bethany. Today, let us pray with Jesus and consider the areas of our lives that are in disbelief or do not allow us to worship the Lord. Then, ask Jesus to drive it out and purify us. Time to prepare for the Bridegroom.